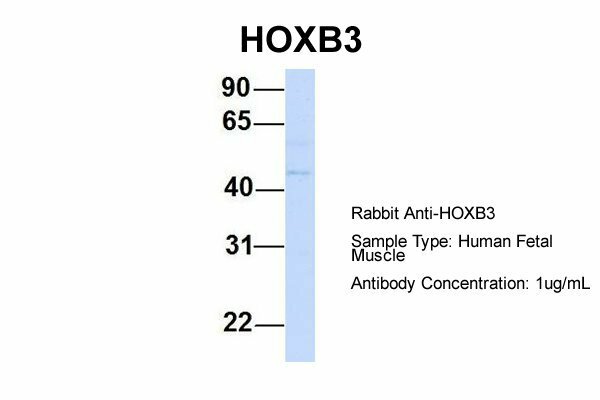 HOXB3 belongs to ANTP homeobox family. 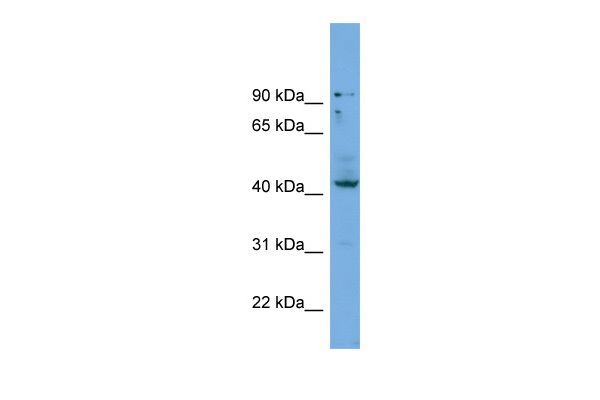 It is a nuclear protein with a homeobox DNA-binding domain. HOXB3 gene is included in a cluster of homeobox B genes located on chromosome 17. 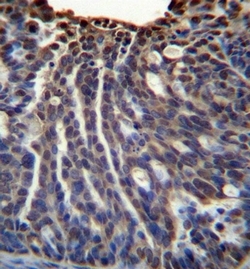 The protein functions as a sequence-specific transcription factor that is involved in development. 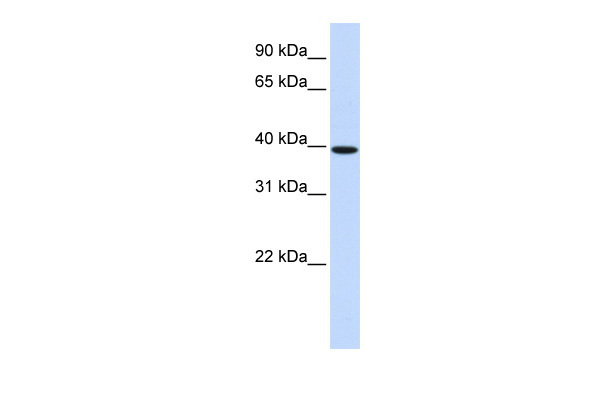 Increased expression of this gene is associated with a distinct biologic subset of acute myeloid leukemia (AML).This gene is a member of the Antp homeobox family and encodes a nuclear protein with a homeobox DNA-binding domain. It is included in a cluster of homeobox B genes located on chromosome 17. The encoded protein functions as a sequence-specific transcription factor that is involved in development. Increased expression of this gene is associated with a distinct biologic subset of acute myeloid leukemia (AML). Publication Note: This RefSeq record includes a subset of the publications that are available for this gene. Please see the Entrez Gene record to access additional publications. 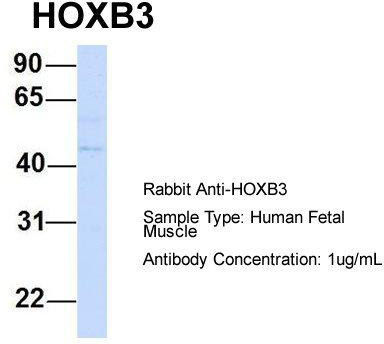 immunohistochemistry analysis in formalin fixed and paraffin embedded human ovarian carcinoma reacted with HOXB3 / HOX2G Antibody (Center) Cat.-No AP52078PU-N, which was peroxidase-conjugated to the secondary antibody, followed by DAB staining. 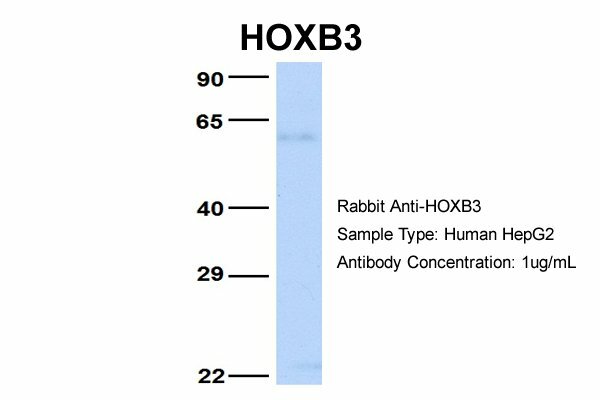 Western blot analysis of HOXB3 / HOX2G Antibody (Center) Cat.-No AP52078PU-N in HL-60 cell line lysates (35ug/lane). 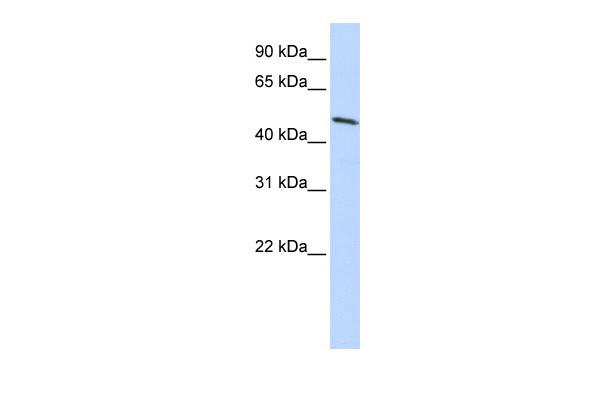 This demonstrates the HOXB3 antibody detected the HOXB3 protein (arrow).